Ace Helpful in the HART of the Community! As a locally owned business, we at Hart Ace Hardware depend on our community to support us. We feel it is important for us to return that support through the backing of local causes and charities. Hart ACE Hardware donates to various churches, schools, volunteer groups and children’s organizations such as high school and youth sports programs, and Boy and Girl Scouting organizations, and Habitat for Humanity just to name a few. We support our community through service to the local Chamber of Commerce with the annual Bellevue Picnic and are proud charter and annual donors of the Bellevue YMCA. 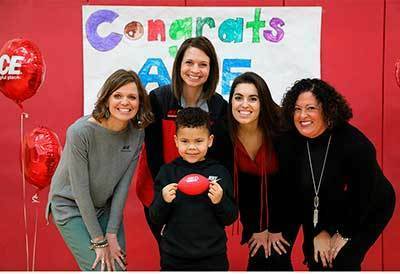 We are most honored to be affiliated with the Children’s Miracle Network through the Ace Hardware Corporation Foundation where we raise over 10K every year to support our very own local Monroe Carell, Jr. Children’s Hospital at Vanderbilt! We receive many donation requests every day and we participate in as many projects and events as possible. Do you have an event or project you would like us to contribute to? Click here to submit a donation request form.